A current exhibition at the Countway Library of Medicine, Battle-Scarred: Caring for the Sick and Wounded of the Civil War, examines the American Civil War from a particular perspective, to commemorate those who died in battle and also document the experience of the wounded and the ill and the men and women who cared for them on the battlefield, in hospitals and prison camps, and on the home front. The exhibition was curated by Jack Eckert and Dominic Hall; an online version created by Jennifer Hornsby appears on the website above. 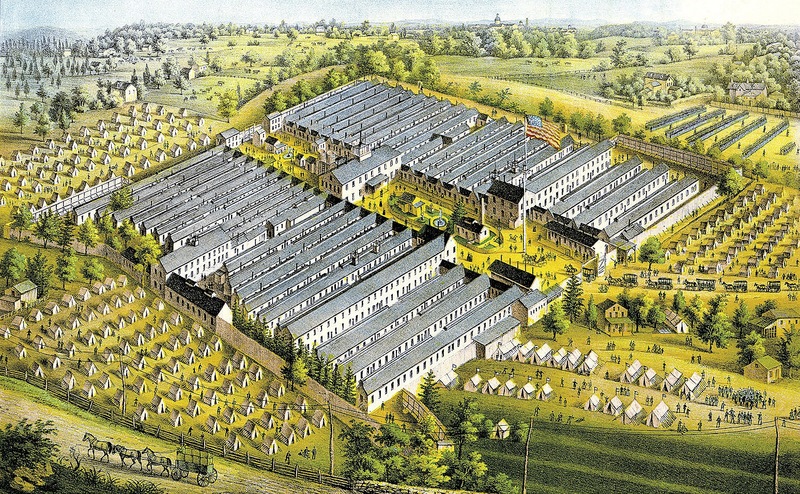 This lithographic bird’s-eye view from the exhibition of the Satterlee U.S.A. General Hospital in West Philadelphia, done by Charles Magnus in 1864, with the numerous hospital buildings surrounded by a village of tents, gives a notion of the scale of the medical and human problems faced. 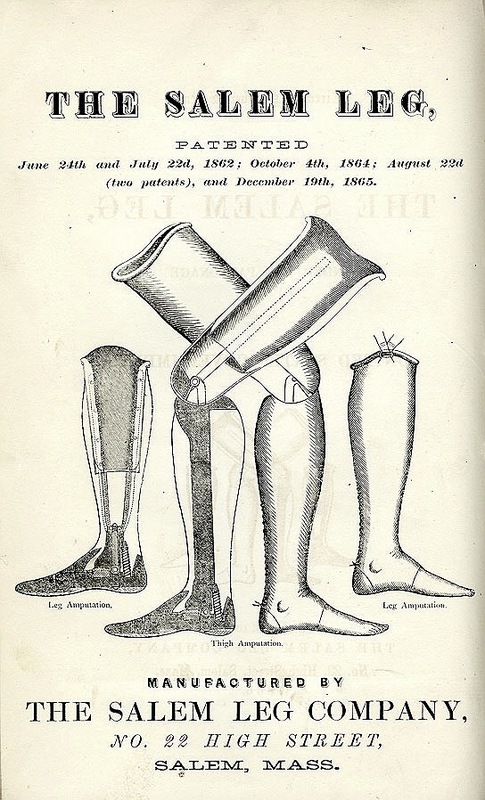 All wars lead to advances in the treatment of trauma, and much was learned about amputations and artificial limbs from the Civil War carnage. 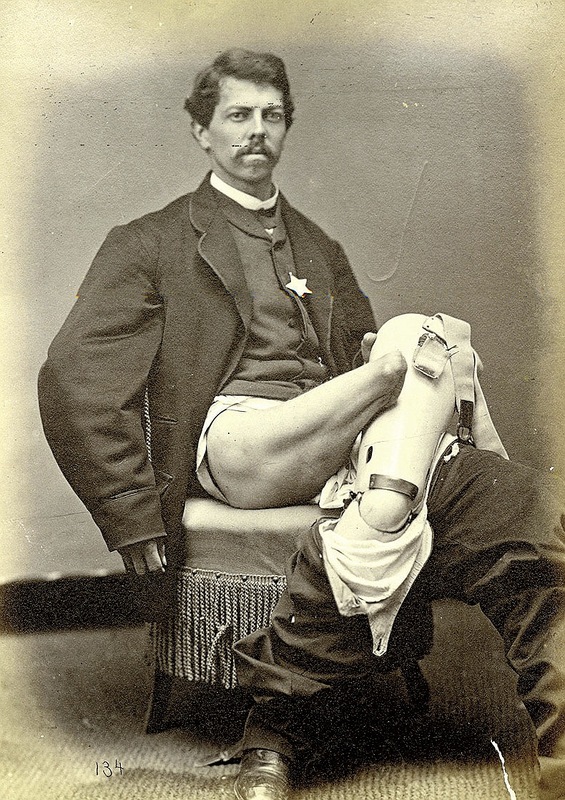 Charles T. Greene, above, had his leg amputated at the knee after the lower part was carried away by a cannon ball. The photograph, by William Bell, circa 1864, was one of many examples of surgical cases and specimens published by the Surgeon General’s office for the edification of the medical profession.